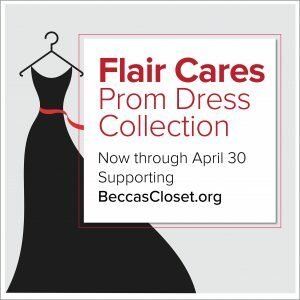 Flair Cleaners is hosting the Flair Cares Prom Dress Collection April 1 to 30 to benefit Becca’s Closet, a nonprofit providing formal attire for local high school youth who cannot afford new dresses. Customers and community members may donate gently worn long and short formal dresses and accessories at all Flair Cleaners locations. Flair Cleaners will dry clean each item before giving it to the nonprofit. Becca’s Closet was founded by a high school student in Florida in order to provide prom dresses and accessories to high school girls who could not afford to purchase them. She believed that no one should miss a high school event because they couldn’t afford to be there. In the spring of her sophomore year, Becca singlehandedly collected and donated over 250 formal dresses. She helped hundreds of girls across South Florida attend their High School proms in style. Today, countless dedicated people throughout the United States have joined forces with Becca’s Closet. Annually, they collect and distribute dresses to high school girls with financial need.